If you’re using a credit card issued by a mega-bank such as Citi, Bank of America, Chase, or Wells Fargo, with each charge you could be supporting destructive pipelines, fracking, tar sands, predatory lending, fraudulent foreclosure practices, and outrageous CEO salaries. Instead, you could be supporting local communities, a clean environment, local and green businesses, fair housing loans, and more with a Green America credit card! Green America partners with TCM Bank, N.A. to issue their own Visa cards, as well as affinity cards affiliated with non-profit organizations that support various progressive missions. TCM Bank is owned by ICBA Bancard, a subsidiary of the Independent Community Bankers of America. These cards offer competitive terms and rewards points with no black-out dates for travel. 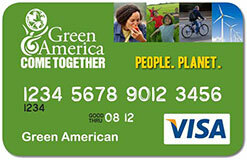 In addition to the Green America credit card, there are many more to choose from.